We can design, supply and fit kitchens of all shapes and sizes, project managing the work for minimum disruption. From an initial site survey, through planning and design, delivery and installation, we use our experience to ensure everything runs smoothly, and you get the kitchen you want. Not everybody needs our design and supply service, if you want to design and purchase your kitchen yourself and just need it fitting, we will take care of that, and install your kitchen to the highest standards. 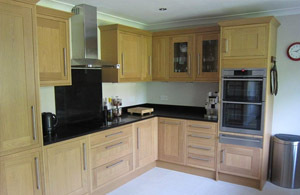 With many satisfied customers, and experience of standard, luxury and unusual designs, we will work with you to install your kitchen as you want it. Whether it is replacing the taps or a installing completely new kitchen, we will manage the whole project in a fully controlled and coordinated manner, and provide you with a single point of contact while we coordinate all of the tradesmen, suppliers and deliveries as required. In any household it is vital that the kitchen remains in use throughout any updates, and we will work with you to plan the project so that you can continue to use your kitchen for as long as possible and with minimum inconvenience. We have been establish for over 8 years and have many hundreds of satisfied customers. We are proud to have so many references and you can see just some of the kitchen refurbishment references by clicking here. For every project, we conduct site surveys and produce prompt and detailed estimates. We schedule the work and tradesmen appropriately and aim to make our service a pleasant experience for all concerned. We have also found that clients often need a range of other specialist trades and The Painting Partnership is able to meet these requirements by employing our own skills or using our wide network of professional tradesmen that we know and trust. Our customers regularly compliment us at the end of a job and we take genuine pride in the fact that we always leave our customers delighted and with the contract complete to their satisfaction. ‘Decorating, Renovating, Fitting’ and ‘Professionally Managed Services’ are more descriptive of what we deliver. And the tag line to our business; ‘Prompt, Reliable, Clean and Tidy’ describes our work ethic.